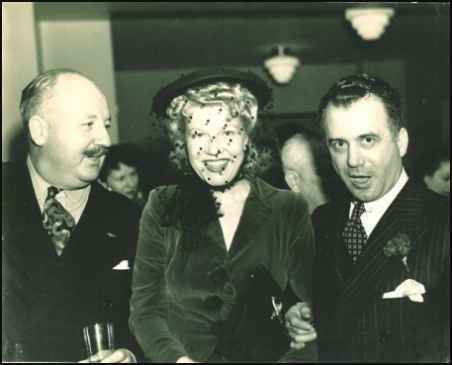 " I've determined from a cover letter mentioning the photo that the scene was actually Jordanoff's Christmas 1942 party at Jordanoff Aviation Company, 595 Madison Ave., NY." To contact Mr. Linder, click on his name. ONLINE RESOURCES If you search for "Assen Jordanoff", using the Google search engine, (4-15-04), you will find about 153 links. 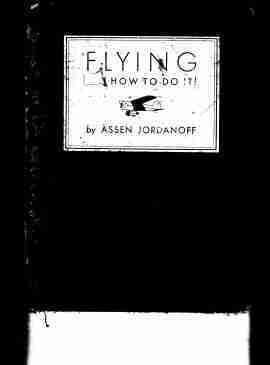 If you search on "Assen Jordanoff" +aviation, you will still find some 60 links, most of them being offers for sale of his several books, many of them obsolete. It will require some patience to find websites which feature his life and career. Perhaps the most productive starting point is the one immediately below. 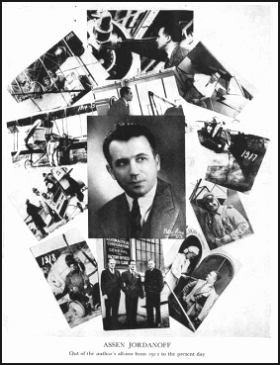 By Plamen Antonov This biography by Plamen Antonov was just recently revised and updated and represents the most extensive and authoritative source for information on his life and career. Each feature of his life and career has been carefully researched and the resulting text is generously illustrated with rare photographs. You can access the page by clicking on the title above. TUS ALAS. MANUAL PRACTICO DE AVIACION.- Editado en Barcelona: Gustavo Gili, 1941: Portada, 287 págs. + dibujos de Frank Carlson que ilustran el texto. Manual práctico de aviación; OctavoMayor.- Rústica. As of this date, April 15, 2004, you will find offers of many of these books on the web. 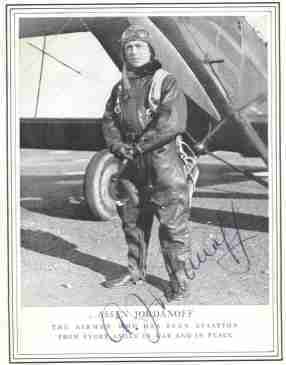 Simply use "Assen Jordanoff" as the search term on Google, or use the name of the book you are seeking. 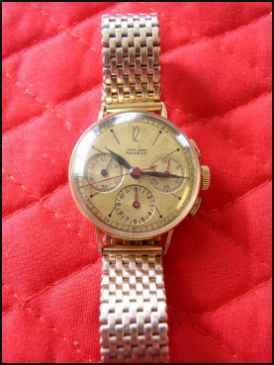 You will probably find some valid links, although others may be obsolete. 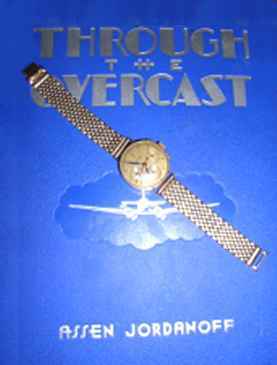 Collection of Paul Lee, 4-2-05 "This is my autographed copy of Assen Jordanoff's "Through the Overcast". 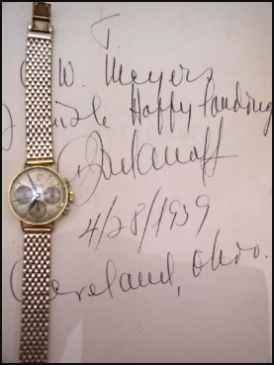 The gold watch which is seen on the book is inscribed on the back "Presented to Assen Jordanoff from Dean C. Smith". I've done a lot of research on Mr Jordanoff but Mr Smith is a little harder to find info on. I noted on your Dean C. Smith page, at the bottom, you have a couple of small pics of Mr Smith and his book "By the Seat of My Pants". I just found an ex library copy of the book online and purchased it. 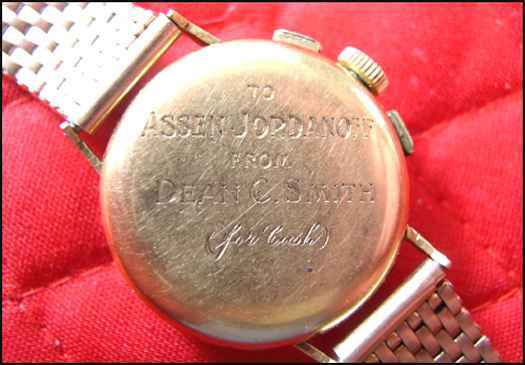 Hopefully Mr Smith's book might provide some insight as to what his connection with Assen Jordanoff was which led him to making a presentation of the watch."